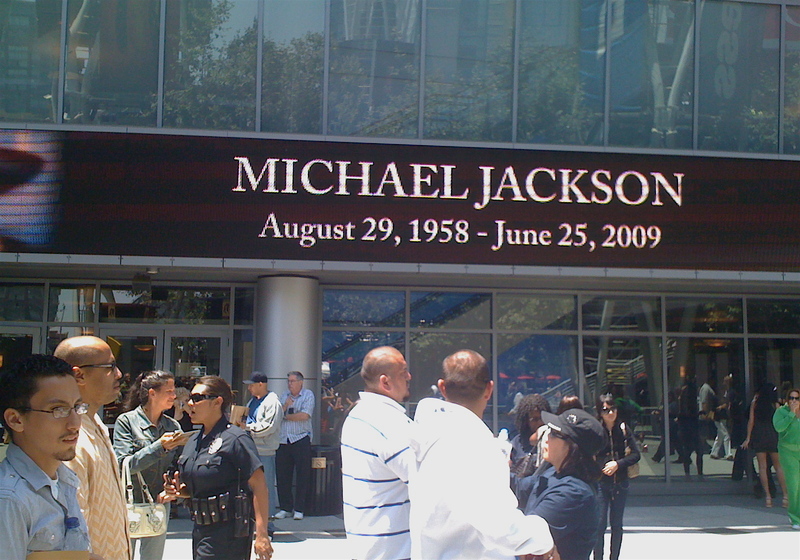 This morning, the world watched and celebrated Michael Jackson’s life with a memorial service that took place in Los Angeles at the Staples Center, where Jackson had been rehearsing his “This Is It” tour. Police warned people to avoid the downtown area if they didn’t have tickets so I stayed in front of my TV like a dutiful citizen. But a friend of mine, actress-singer Charlene Modeste, won tickets in a lottery to attend the service. I spoke to her afterwards about her emotional experience and she shared some details we didn’t get to see on TV, along with these photos she took. PCN: What was it like getting there this morning? Charlene Modeste: I was up around six, turned on the news, saw people were already waiting to get in. I didn’t leave my house until 7:30-ish [the service was scheduled for 10 a.m. PT] so there was traffic and I had to redirect myself and get a secret back way on the 2 [freeway]. Usually takes me 15 minutes but it took me half an hour. My friend lives downtown so I parked at my friend’s lot and we walked over…There were all these people selling Michael Jackson T-shirts, buttons, posters. Parking lots were $40. Everyone was really calm and respectful, there were cameras pretty much all over the place. Police were checking for wristbands and tickets. There were a lot of people but everyone was really subdued. PCN: Was that because it was early and people were still waking up or was it because of the occasion? CM: I think it just hit everybody. To hear about him passing away is one thing; it didn’t really register until the memorial started. There were people there for different reasons—for the spectacle, to celebrate, to pay respect. Some were there just for the community, to share in something we all had in common. There were some who were there for the party, you know, Whoo hoo! I thought it was strange, but you have to take into consideration whose funeral it is. People react to things in different ways. The overall feeling of the crowd…I wouldn’t say it was somber but people were very quiet. I was in the overflow in the Nokia [Theatre] but [my friend and I] were texting someone who was in the Staples Center. Smokey [Robinson] came up first and read letters from Diana Ross and Nelson Mandela. We thought someone would come up right after him but no one came for a really long time. If that happened at a rock concert, people would’ve reacted but no one made a sound. Everyone was so patient, anticipatory for sure, but very respectful. When we walked in they were playing Frank Sinatra, whom I adore, but someone behind me started playing Michael Jackson songs on his mp3 player. I said, “Can you turn that up?” He said, “This is as loud as it can go but maybe if I hold it up higher, you can hear it better.” I started thinking, “Why aren’t they playing Michael Jackson songs?” I mean, no disrespect to Frank Sinatra. I asked one of the ushers to say something to someone in the booth to start playing Michael Jackson songs and two minutes later, they started playing his songs. PCN: So you wanna be startin’ somethin’! Sorry, couldn’t resist. Anyway, what were the most emotional moments for you? CM: There were so many! There was Paris [Jackson’s daughter], of course. There was Marlon; the first words out of his mouth that I could hear were “I hurt.” That was definitely a moment. I didn’t know what to expect. I got these tickets as a fluke. As far as I knew, it was gonna be a concert. From the beginning, when they were singing the hymn, setting the tone, that was the hymn I grew up with in church. And they rolled out the casket, which I didn’t expect at all. So that knocked the wind out of me. It hit me—I’m at a memorial service, it’s gonna be an emotional service. Usher was another [emotional moment], Brooke Shields, anyone who shed tears, Jermaine. Paris broke my heart. That’s not her dad, it’s her Daddy. She’s still a little girl. I wasn’t expecting to be moved as much. I shed so many tears this morning, which was definitely a surprise because it wasn’t someone I knew personally. PCN: Did anything special happen that wasn’t televised? CM: Absolutely. When the telecast was over, we were just gonna leave. But they brought mikes, floral arrangements onto the stage. Someone said, “The family’s coming!” Everyone who was making their way to the door turned around, found a seat. Everyone squeezed in to make room for everyone else. We sat and waited quietly for a while. Then the three sisters came out—LaToya, Janet and Rebbie—to specifically thank us all for being there. Amidst losing their brother, they came out to say thanks. They didn’t have to; we were on our way out. I think that was absolutely great. PCN: That’s very classy. So, was the whole process worth it? CM: It was so worth it; I’m so glad I went. It was a great experience which really put things in perspective for me, the influence he had in my life and the influence he had on the world, the possibility of what one person can achieve in their life and what’s possible for those of us who are still here can achieve as we move forward. It definitely had a huge impact on me. Even with his passing, he’s continuing to inspire. OMG…what an awesome experience! I know exactly how Charlene felt, Elyse. We went to pay our respects to MJ at the Jackson family compound in Encino the night before the memorial service and were totally stunned by how sad we felt. It was like it finally hit us that Michael Jackson was actually dead. The mood there was magical, and totally reminded both my wife and I of our visit to Graceland during Elvis Week 2007. Touching, tender and a total once a lifetime experience. I’m amazed that there would be lottery tickets for a memorial service. I can’t quite grasp that concept. But how special for people who weren’t family or associates to be able to be there to share in the experience. Thank you, PCN, for interviewing your friend Charlene so we could share some of that too. It’s still hard to grasp that he’s really gone. The biggest surprise for me was that there wasn’t as much chaos as predicted. Watching from work, I was a bit underwhelmed. It’s like with the MTV Michael Jackson: King Of Videos special they ran over the weekend. They decided to just use a bunch of talking heads who spoke over the videos they were extolling. WTF? It was insulting. They didn’t even show BAD or THRILLER in their entirety? Ridiculous! So reading about Charlene saying they were playing Frank Sinatra when she arrived was just sad. There’ll be many tributes, I’m sure, but none have really celebrated what Michael Jackson was all about. Thanks for the inside scop, PCN. A wonderful interview, PCN. Thanks. Thanks for this inside view, PCN, it’s great to read how it felt like from there. I watched the ceremony on TV and found it classy and respectful though a bit long and flat at times. As far as I’m concerned, I was very touched by Brooke Shield’s spotless speech and by the cover of “We are the world”(it gave me gooseflesh).